By all accounts, winter rye is in a renaissance. Cover crop craze aside, the rebirth of winter rye appears to be driven more by its utility as a forage crop, especially in the corn silage growing areas of the U.S. This past fall, as I was spending a day jumping from farm to farm in Lancaster County, Pa., I stopped at one particular dairy operation where the owner told me, “I’m down to one last alfalfa field. When it's done, everything will be in a corn silage-winter rye rotation.” Though this was an extreme “all-in” approach, another large dairy I visited on the same day was growing nearly 600 acres of the winter cereal and had a dedicated bunker silo for the crop. 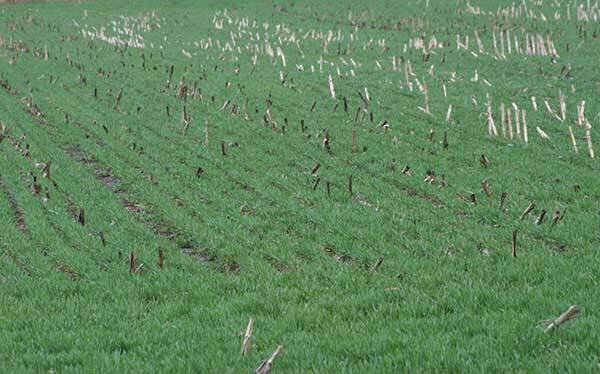 The incorporation of winter cereals such as winter rye and triticale into crop rotations in New York has been substantial enough that the Cornell Nutrient Management Spear Program initiated a research study. The study includes economic analysis of the double-crop system along with survey results of farmers who have employed the practice. The results are largely positive, but management plays a large role in profitability. It’s the rare situation where a crop that has been around for so many years experiences such resurgence in use. For the most part, we’ve figured out what works best and where, then improve on performance through crop breeding and management. Perhaps it has been the increased love affair with corn silage that has led farmers to winter rye, which seems to sandwich nicely between corn silage crops in areas where the growing season is simply too short for most double-crop options. What’s interesting to note among serious winter rye growers, those who grow it every year, is the varied reasons for doing so. Many were in search of a heifer or dry cow feed that didn't pack quite the nutritional punch of corn silage or alfalfa. Others cite winter rye’s consistency in terms of yield and quality, often feeding it as a significant component of the milking cows' ration. Some have been attracted by the crop's soil conservation and quality attributes. Finally, there have been some dairy producers who like or need an additional manure-spreading outlet in late spring. Often winter rye was initially grown as a need for some emergency forage. Like most forage crops, the quality and yield of winter rye depends on when it is cut. Those seeking feed for lactating cows need to be ready to cut by boot stage or before. For heifer feed, the window is a bit wider. Either way, cereals mature quickly so there’s not much room for error. If cut in the boot stage, digestibility can be relatively high with protein over 15 percent; if fields are wet or rain persists during the time winter rye needs to be harvested for optimum quality, plan on an abundant amount of heifer and dry cow forage. For my money, the dealmaker or breaker concerning winter rye is the impact on the subsequent corn crop. This is a particularly important issue across the northern tier of states with short growing seasons. On the plus side, sandwiching a winter cereal between two corn silage crops provides a rotational benefit to the second-year corn. The degree to which this occurs varies with the year, hybrid planted and how long planting is delayed: A mix of factors sometimes within the control of a grower, sometimes not. The worst two first-generation armyworm-damaged cornfields that I’ve ever seen were both following winter rye. Armyworm moths, if present at the right time and place, find cereal grass an attractive egg-laying habitat. Though not a reason to avoid the practice, it is cause to pay close attention to cornfields following winter rye. It’s difficult to know if the recent popularity in winter rye and other winter cereals will persist or decline. Either way, there’s no doubt that cereals will continue to fill a forage need on at least a small number of acres for many farms and provide additional feed in short-forage years. If you’re contemplating a move to some or more winter rye, do your homework and have a management plan. This is a crop that requires adequate amounts of nitrogen to perform at its best from both a yield and quality perspective. Also, be sure you're buying quality, germination-tested seed.